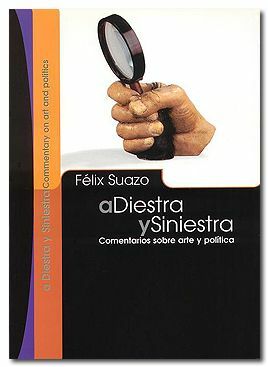 Félix Suazo (Holguí­n, Cuba, 1966), visual artist, professor, researcher and an active curator in Venezuela since the nineties has compiled six of his texts, written between 1999 and 2004, into this book, A diestra y siniestra: Commentarios sobre arte y politicas, which focuses on the relationship between art and politics. The texts comprise a previously published article "Redefining the political in contemporary creative practices"revised versions of four lectures given at different seminars and congresses, these being Art and Politics (notes) , The Politics of Language: Purist Art, Commitment, Negotiation and Criticism of Representations in Venezuelan Art, Social Art and Gender Issues (notes) , and What Is Happening to Ethics? In addition there is an unpublished essay, Vanguard and Officialism (From Mexican Muralism to Venezuelan Kineticism) . Placing emphasis on an examination of contemporary art, Suazo tackles his subject by going back and forth between theoretical issues and an analysis of specific artistic approaches, many of the latter focusing on the Venezuelan scene in the nineties and the beginning of this decade, while also delving into the history of art in Latin America, particularly in the last essay. Since the book is a compilation, the thesis on which Suazo's views are based is not stated explicitly until the third essay - also the third listed above - in which he laconically declares that "art cannot be separated from politics". Given the context in which he makes that assertion and its extreme degree of generalization, this is tantamount to saying any work of art - absolutely all art, past or present, here, there or anywhere - is intrinsically political: a deconstructionist way of understanding the link between art and politics that echoes the statement made by Carol Hanisch in 1969 that "the personal is political", which quickly became an emblem of the feminist movement. Be that as it may, it is as difficult as it is stimulating to grapple with such a fascinating, sweeping thought on shaping a system of ideas designed to provide a rationale for the specific relationships - of one kind or another - that can be established between art and politics in a work of art. In opposition to this is the diversity in all areas that is characteristic of the relatively autonomous field of material and symbolic production that is art, as well as the possibility of overestimating the concept of the political in its condition as a methodological instrument of research. One could have focused research on what could be better explained within gnoseological perspectives of other ideas. If the limits of the political are too restricted, the corresponding analytical procedure, reductionist by nature, always leads to some form of dogmatism. Whereas if those limits are dissolved to the point of innocuousness, the political becomes distortedly amplified, with a danger of arriving at banal conclusions. Suazo is aware of these problems - and others regarding the subject under discussion - as he shows in his texts.